Our dinner came with a whole squab, split between the two of us, and they scrupulously made sure that we each got half..of the head. A great Chinese seafood restaurant in Portland? That’s something I thought I left behind in the Bay area (or DC), but I gotta say Wong’s changed my mind. Don’t go there if your Chinese food appetites extend only as far as kung pao chicken or broccoli beef. But if you’re looking for, say, sliced abalone in oyster sauce (or goose intestines with bitter melon), this is the place to go, maybe the only place in Portland. The menu is huge and bewildering. Robyn and I played it safe with the “dinner for two,” gulping a bit at the price ($98) and suspecting we were going to drown in food. We were right (it was a meal for four, not two)….but it was uniformly imaginative, delicious, and fun. 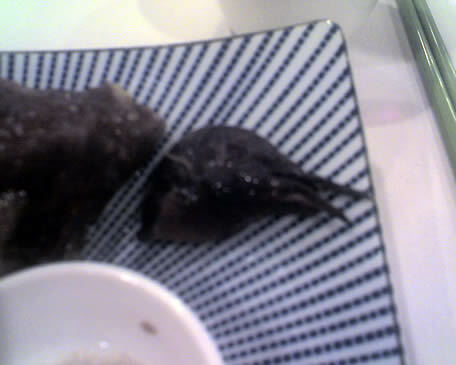 Shark fin soup, abalone, oyster and crab in rice, whole lobster & whole squab (split between the two of us), etc. Service was perfect, they acted delighted to see us, and PRESENTED the food instead of slapping it on the table. Tip: If the menu overwhelms you, relax with a beverage and appetizer for a few minutes and watch what everyone else is having. Find something you like, then pounce and find out what it is. Update 4/24/08: Went back again tonight; Robyn’s husband Jeff (my cousin) heard about Wong’s and wanted to try it. This time we decided to pick three dishes and an appetizer instead of opting for the combo meal. As we suspected, it was less expensive, about $32 apiece. It was also enough food for five or six people and we had a huge doggy bag to bring home. As my mother says, the formula for ordering Chinese is “number of diners minus one or two,” and with four dishes, we were at least two too many. But boy, was it good. We started with some little shrimp dumplings in an odd sweet cream dressing. They were tasty, but nothing like what followed: Beijing Duck, fresh shrinp (they called it “live”) sauteed in garlic and soy, and General Tso’s chicken. The shrimp were marvelous, the Tso’s was pretty good…but it was all eclipsed by the duck. It was classic Peking/Beijing Duck, where they bring out the WHOLE duck (facing us, bill and all, and I have to confess the first thing that popped into my head was “AFLAC!”), slice off the crispy skin and serve it in steamed buns with hoisin sauce and julienned shallots. Then, while you’re chowing down on delicious duck skin, they cut up the meat and bring it back out, with duck sauce. Mmmmmmmmmm. At the end of the meal they brought out a complimentary dessert–split peas soaking in what tasted like cold sugar water. I suspect this is an acquired taste (which none of us had acquired) but fortunately, we were too stuffed to eat it, anyway. But as far as Wong’s is concerned, this meal put them up even higher on my list than before. Definitely give these guys a shot.